ASEAN? Do you mean Asian? Many think that when one says ASEAN (Pronounced: Ahh-see-yan), one is saying Asian with a strange accent. In reality, ASEAN is just a small chunk of the huge continent of Asia. ASEAN stands for the Association of Southeast Asian Nations and is currently comprised of 10 countries: Brunei Darussalam, Cambodia, Indonesia, Lao PDR, Malaysia, Myanmar, the Philippines, Singapore, Thailand and Vietnam. Some say that ASEAN is a ‘wannabe’ EU. ASEAN, however, was first formed in 1967, even before the EU. Similar to the EU, ASEAN was initially formed for political and economic reasons – basically so that the member countries would not wage war against each other and to make trade easier. When it came to children’s rights, one could not even mention this in ASEAN’s early days. Many ASEAN countries were under military or authoritarian rule where human rights, more so children’s rights, were considered taboo or unheard of. The 1967 ASEAN Declaration which officially formed ASEAN had no mention at all of human or children’s rights. In 1983, the first non-binding instrument on ASEAN somehow related to children’s rights was passed: the ASEAN Declaration of Principles to Strengthen ASEAN Collaboration on Youth. However, this declaration had little to no impact on the emergence of children’s rights in ASEAN as it was not used to generate any (binding or non-binding) standards. Regionally, there is no single comprehensive instrument containing the rights of children in ASEAN unlike Africa’s Charter on the Rights and Welfare of the Child (ACRWC). However, ASEAN has passed several instruments containing references to children’s rights found in the Convention on the Rights of the Child (CRC) which all 10 ASEAN states have ratified. The most prominent instruments which contain direct references to children’s rights are: the ASEAN Convention against Trafficking in Persons in Particular Women and Children (ACTIP), ASEAN Human Rights Declaration (AHRD), the Declaration on the Elimination of Violence Against Women and Violence against Children, and the Ha Noi Declaration on the Enhancement of Welfare and Development of ASEAN Women and Children. This blog is based on an LLM thesis entitled ‘A Legal Analysis of Selected ASEAN Conventions and Declarations from a Child Rights Perspective’ which analysed these instruments. Looking at the abovementioned instruments as a whole, they cover almost all rights found in the CRC except eight (8). The CRC rights that were left out are the best interests of the child in art. 3, parental guidance and evolving capacities in art. 5, identity in art. 8, non-separation from parents in art. 9, family reunification in art. 10, protection from abduction in art. 11, freedom of association in art. 15, and the review of treatment in art. 25. The reasons behind the exclusions of these rights are yet to be determined. It is difficult to identify the specific reason behind this for the lack of travaux preparatoires or literature on the drafting of these documents. Also, many, except the AHRD, were formed behind closed doors. The rights that are mentioned the most are those on protection from violence and regional cooperation with knowledge sharing. The latter is not surprising for one of the core purposes of forming ASEAN was for regional cooperation. Violence against children in all settings has been identified as one of the common key critical issues in ASEAN which can explain why the instruments seem to focus more on this. The instruments do not technically say anything radically incompliant to the CRC but are often worded broadly and vaguely. Concerning the General Principles of the CRC, none of the instruments mention the best interests of the child (article 3, para. 1) although none of the ASEAN Member States have made reservations to this general principle. Also, only the AHRD contains a provision on non-discrimination. When one looks at the instruments on children’s rights in ASEAN, it can be seen that the ASEAN policy standard on children still follows a welfare approach where most of the commitments and recognised obligations focus on welfare provisions and the notion that children only need to be protected. Although some rights in the ASEAN instruments are merely mirrors of those found in the CRC, there are still striking differences. There is hardly any mention of civil rights and freedoms but many on economic, social and cultural rights. A study has put together the elements of an advanced human rights system and this can be applied to children’s rights. It said that the key elements for a well-equipped, functional and effective human rights system are the following: First, that all the countries in the region are part of the system and are bound by the legal commitments equally. Second, a regional human rights treaty is in place and a system of monitoring and ensuring its implementation is in place. Third, a complaint mechanism or a judicial procedure which can assess and adjudicate on human rights violations that is available and accessible to victims. Fourth and last, a system of follow up and enforce of these decisions. From the description above of the systems in Africa, the Americas and Europe, all three fulfil these criteria to a certain extent one way or another. ASEAN, however, only fulfills the first criteria. The next plausible criteria it can comply with in the immediate future is the second in the form of a comprehensive instrument on ASEAN children’s rights. Such a comprehensive instrument can take into account the current situation of children in the region and the historical experience of the ASEAN children. This is what the African child rights system did with the ACRWC. After all, there is already a possible mechanism that can monitor and enforce such an ASEAN treaty – the ASEAN Committee on the Promotion and Protection of Women and Children or the ACWC. The ACWC, however, is weak in terms of protecting children’s rights for its lack of an investigative mandate. A comprehensive regional treaty can give a Charter-based mandate to the ACWC, therefore strengthening it. ASEAN is not yet at such a level that it can manage without a comprehensive treaty and merely rely on an adjudicating body to interpret AHRD provisions in line with international obligations under the CRC, such as what is being done in the Inter-American and European systems. At this point in time, ASEAN is still seen as quite weak as a regional child rights system. Contributing to this weakness is the lack of a comprehensive binding treaty paired with an effective body that can promote and protect children’s rights. However, and given the existence of the ACWC, this can be strengthened with a comprehensive regional treaty on children’s rights that will pave the way for it becoming strong and effective. 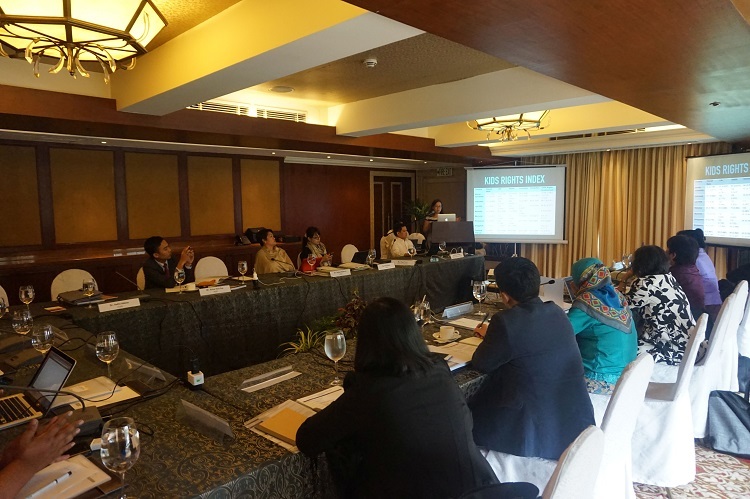 The thesis upon which this blog is based was presented at a recent ASEAN Policy Dialogue on Children’s Rights (photo below) attended by various government and inter-government representatives from ASEAN.